Scran is a military word for food and it’s clear as to why Tactical Beard Care named Tactical Beard Care ‘Scran’ Beard Balm this way. A combination of Organic Bee’s wax, Shea Butter, Argan Oil, Vitamin E, Cocoa butter and Jojoba Oil into which essential oils are added to get that Chocolate Orange scent. The result is a balm that gives a good but natural hold to your beard whilst reminding you of the Terry’s Chocolate Orange that always lurks in the fridge at Christmas. The scent is quite nice, it has a nice lingering aroma that isn’t too strong and sickly. As with the other Tactical Beard Care Balms, ‘Scran’ left my beard looking good as well as smelling good. I prefer a balm to an oil now my beard is getting longer and so I enjoy testing them. 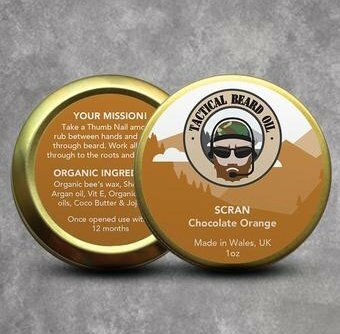 ‘Scran’ Beard Balm from Tactical Beard Care comes in a 30g/1oz tin and is available from their website for £9.99 or £7.49 a 25% saving if purchased as a subscription. Couple that with the incredible customer service and you have no excuses to not buy your beard care from Tactical Beard Care.